During the spring of 1971, the 2nd Squadron of the 17th Cavalry guarded the airstrip at Khe Sanh in South Vietnam. They aided American planes flying missions into Laos. On March 23, about 2 o'clock in the morning; Michael Fitzmaurice, 21, one of the men in this unit, came back from guard duty to his bunker living quarters. During the day, the North Vietnamese had been recurrently mortaring American positions, but the night seemed serene. Then all of a sudden, the shells started coming in again. Specialist Fourth Class Fitzmaurice figured it was more than a mortar attack when he checked from his bunker and saw that several North Vietnamese sappers had permeated through the perimeter wire and infiltrated the U.S. position on a suicide mission. Fitzmaurice and a companion got out to the trench that linked the Americans' sandbagged fighting locations. Enemy sappers were all over the place; they hurled two explosive charges at Fitzmaurice, but he managed to throw them back. Unfortunately, a third grenade thudded to the ground near him; realizing that it was about to blow up, he covered it with his flak jacket and threw his body over it. The explosion blew the door shut, and trapped the sleeping GIs inside the bunker, but their lives were spared. Fitzmaurice endured multiple wounds and his left eye was blinded. As the invaders dispersed through the area, he perceived that the end was soon and that he does not want to go down without a fight, so he stood up. With blood on his face, he was hardly able to focus but he climbed out of the trench. As a buddy bellowed directions to him, he commenced firing at the sappers. Then, a North Vietnamese grenade broke his rifle, he knelt down on the ground and felt around for another rifle. 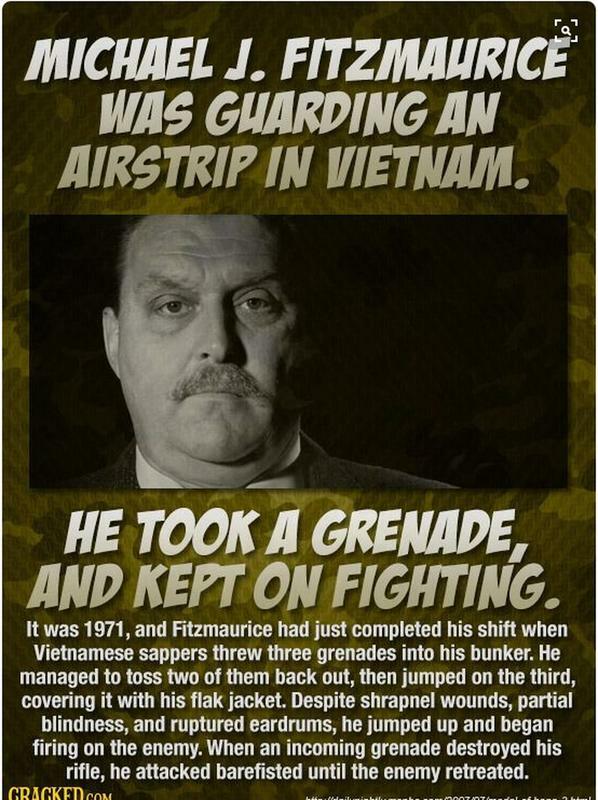 Caught unaware, a North Vietnamese soldier was on top of him; Fitzmaurice assaulted the enemy in a hand-to-hand combat and slayed him. Then he laid hands another weapon, went back to the trench, and began to launch on the enemy again. He refused to be pulled out until the fight was over. Besides losing his eyesight, Fitzmaurice's eardrums were damaged and he had shrapnel all over his body. He was in the hospital for thirteen months. Out of the service for around two years, he was already working in a meatpacking plant. That was in 1973 when the White House called to notify him that he was to be awarded the Medal of Honor. He traveled to Washington; then on October 15, President Richard Nixon bestowed him the medal.